Concrete Rainbow Through Arch Bridge. 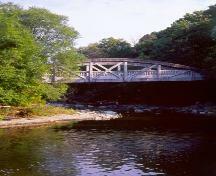 This bridge, built in 1909, is the second example of the concrete truss bridge or the tied arch to be built in North America and the first in Canada. The bridge can support a dead load of 200 tonnes and a live load of 10 tonnes. The bridge is sixteen feet wide with a concrete mix which was one of cement to three of aggregate consisting of sand and crushed stone.